How adorable are these new luggage tags!! Beginning with reservations arriving on Sept. 29, 2015, most Guests booked on a Walt Disney Travel Company package at a Walt Disney World® Resort hotel will receive their luggage tags in the same box as their MagicBands. 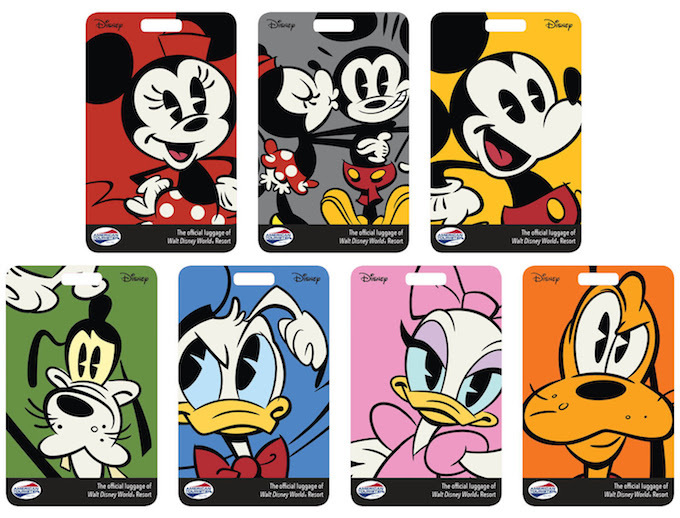 These new luggage tags feature seven unique designs each in a color that will correspond to the your MagicBand. If you have not customized your MagicBand color, you will receive a luggage tag in the iconic grey color to match their MagicBand. The delivery method will vary depending on when your reservation was booked and whether you have customized your MagicBands. Guests who have booked and customized their MagicBands 10+ days prior to arrival will receive their luggage tags in their MagicBands box at home. Guests who have booked and customized their MagicBands 6-9 days prior to arrival, and Guests who have not customized their MagicBands will recieve their luggage tags in their MagicBands box at the Resort hotel. Guests who have booked a reservation 1-5 days prior to their arrival, and Guests who have opted out of MagicBands will receive luggage tags at the front desk of their Resort hotel. Please note Guests staying at Walt Disney World Swan and Dolphin, Downtown Disney Area Hotels, Four Seasons Resort Orlando and Walt Disney World Good Neighbor Hotels will continue to receive luggage tags with Guest documents. I cannot wait to get mine! !